My finished illustration of Rewynd as a mermaid done for my final portfolio show - including all the DVDs and business cars. Out of curiosity...what's the 'bald spot' on her head for? Is it a common characteristic of her people? D'OH! I see it now. Sorry. My eyes were reading it as a 'bald spot' because of the similar colors of her light skin and the headband. 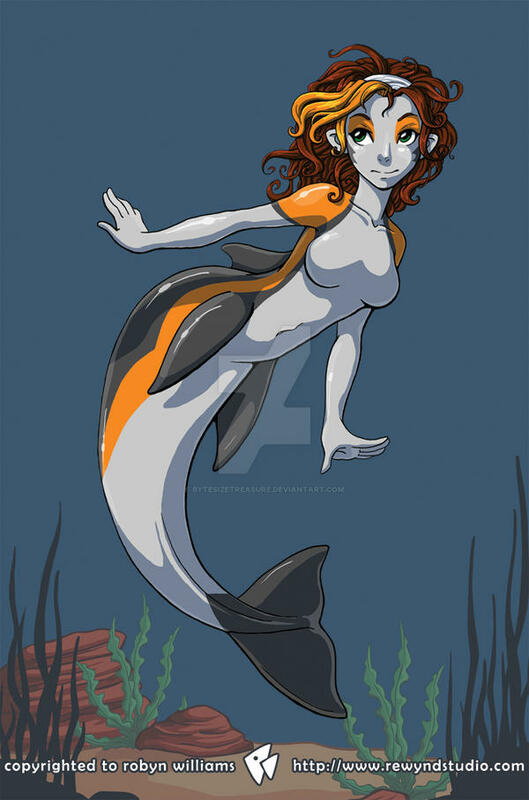 I've always loved dolphins and mermaids, and been of the opinion that the latter would be more like the former instead of fish. This is a beautiful combination and the coloring really makes the subject shine. Excellent work. The colours are a bit different, it works well. Oooh, very nice work! I'm sure she made a good portfolio piece. She's so pretty! I absolutely adore the way her body morphs into the tail! And the choice of colors are fantastic. Nice! I like the coloring! Meh, I don't think they are. Now Ariel, *she* is over used! For what it might be worth, I'd personally love to see more.